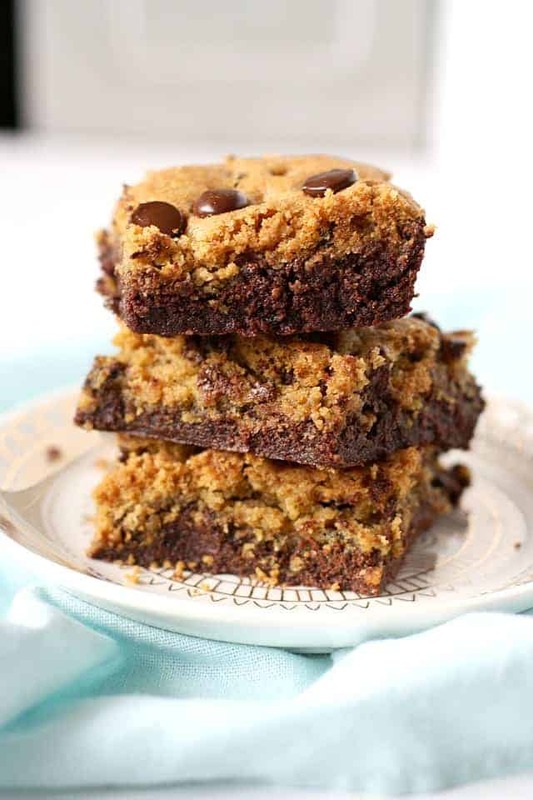 Home » Desserts » Gluten Free Vegan Brookies. An extra decadent treat – with these gluten free vegan brookies, you get two desserts for the price of one! 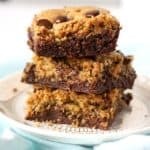 Enjoy fudgy brownies and chewy chocolate chip cookies with every bite. I may be late to this treat trend, but better late than never, right? May I present…gluten free vegan brookies. 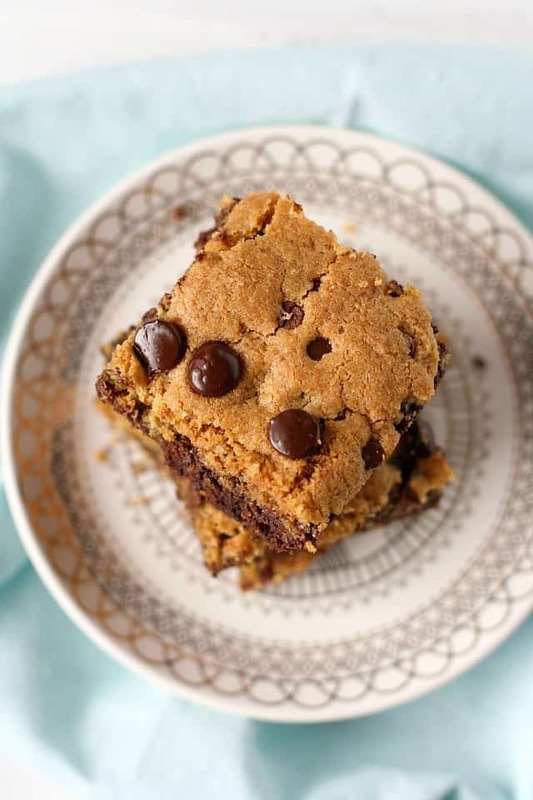 A brookie is a bar or cookie that combines the flavors of fudgy brownies and delicious chocolate chip cookies. In this case, it’s in bar form. The brownie layer is on the bottom, and the chocolate chip cookie layer is on top. In short, it’s a super delicious and decadent treat. One thing that seems to bother my boys a little bit is when they see some kind of really over the top bakery style treat, and then can’t try it because it isn’t safe for them. So I decided to surprise them with a new dessert, and made a pan of these allergy friendly brookies. They loved them. They loved the novelty of two desserts in one! And these brookies are really tasty…they are thick, fudgy, and rich. Just the thing to make for a special treat. What gluten free flour will work best in this recipe? You should be able to use your favorite cup-for-cup gluten free flour blend. I like Namaste Perfect Flour Blend, or my own gluten free flour recipe. Can all-purpose flour be used if I don’t need this recipe to be gluten free? Yes, go ahead and use all-purpose flour if that’s your preference! This recipe will still turn out fine. 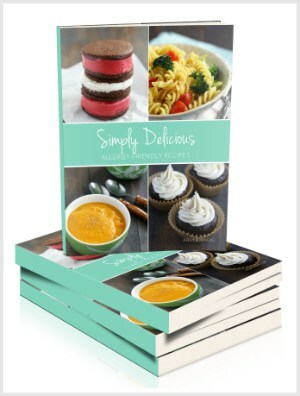 Can I use coconut flour or almond flour in this recipe? I have not tried that, and don’t recommend it. The texture will change significantly if you use those flours in this recipe. If you decide to try it anyway, and it works, please let me know in the comments! 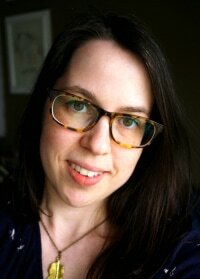 Where can I find dairy free vegan chocolate chips? There are a couple of brands of allergy friendly, vegan chocolate chips. Enjoy Life Foods and PASCHA Chocolate both make chocolate chips that are delicious and allergy friendly. You can find them online at Amazon and Vitacost, and also at your local health or grocery store. I can’t have applesauce, what can I use instead? If you can’t have applesauce, you may like to try mashed banana or a flax seed egg replacer instead. There’s a chance that the flax seed egg replacer may cause the brownies to be a little gummy, so I would try the banana first if you can. How do you make gluten free vegan brookies? 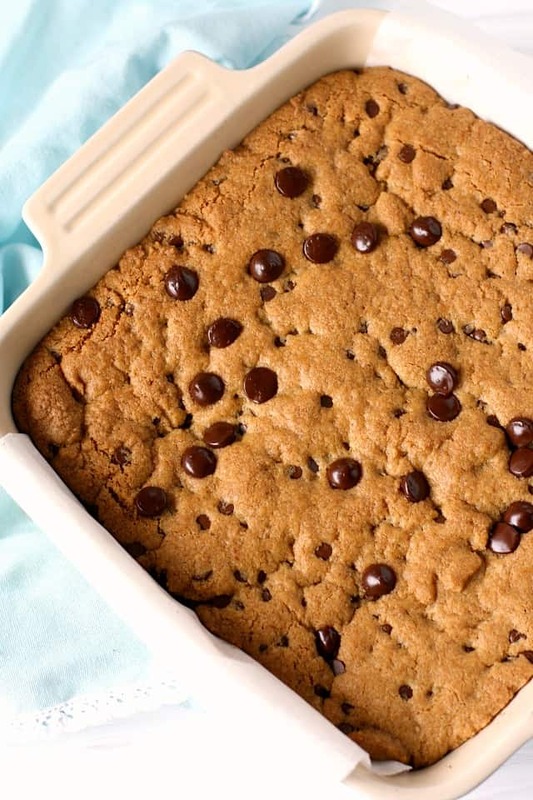 Press the brownie batter into a 9×9 baking dish that has been lined with parchment paper. Rinse your mixing bowl, and make the cookie batter. 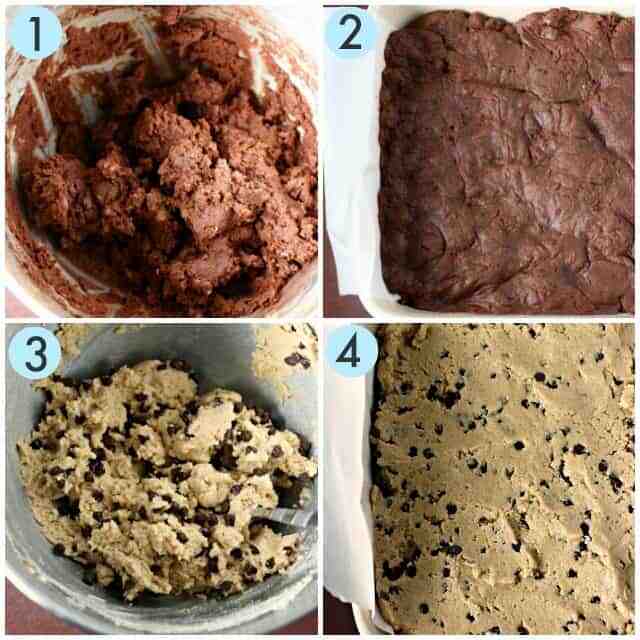 Put the cookie batter on top of the brownie batter and spread it out with the back of a spoon. Bake at 350 degrees for about 35-38 minutes. 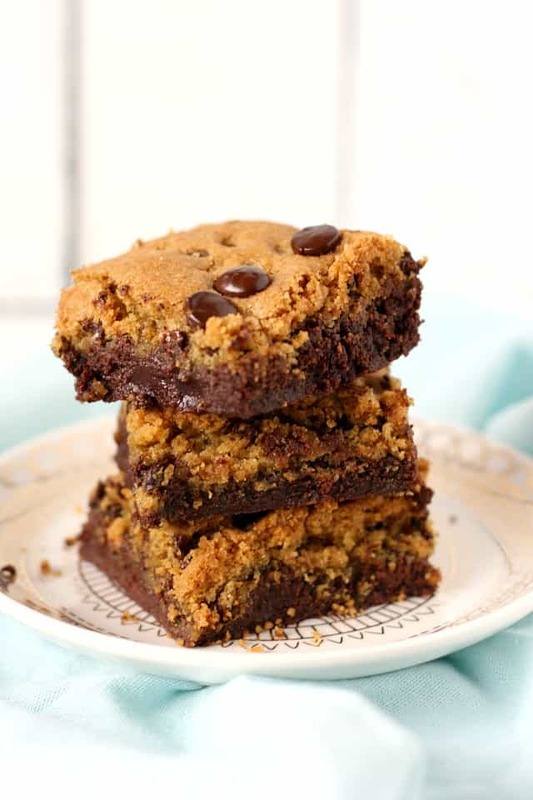 These gluten free vegan brookies are the perfect treat for a special occasion! Thick, chewy, and so delicious, your family will love these bars! Preheat the oven to 350 degrees. Line a 9x9 baking dish with parchment paper so that it hangs over two sides of the dish. Beat the vegan buttery spread and the sugar on medium speed until light and fluffy. Place the dark chocolate chips in a large microwave safe bowl. Microwave for one minute, then stir. Microwave in 10 second intervals, stirring in between, until the chips are melted. Add the melted chocolate chips to the creamed sugar and buttery spread, and mix on low speed. Add the unsweetened applesauce, cocoa powder, gluten free flour blend, and salt. Mix on low speed - the batter will be thick. 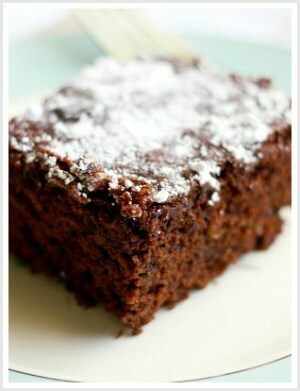 Place the brownie batter in the baking dish, and use a piece of waxed paper to firmly and evenly press the batter down. Set aside. Clean and dry the mixing bowl and beaters. Place the vegan buttery spread, brown sugar, organic cane sugar, and vanilla in the bowl and beat until light and fluffy. Add the applesauce and mix on low speed. Add the gluten free flour blend, salt, and baking soda, and mix on low until combined. Stir in the chocolate chips. Spoon the batter into the baking dish on top of the brownie batter. Smooth it out with the back of a spoon. Bake at 350 degrees for 35-38 minutes. The cookie layer should be golden brown. Allow the brookies to cool before slicing into 16 squares. Store leftovers in an airtight container. You can use regular butter if you are not dairy free. You should be able to freeze these brookies, just wrap well in plastic wrap and store in a freezer bag. Makes 16 bars - nutrition facts are for one bar. 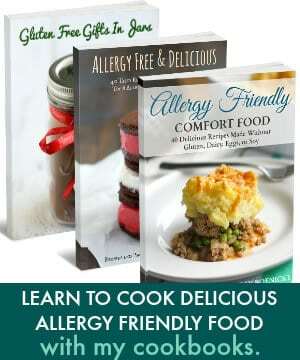 « Make Your Own All-Purpose Gluten Free Flour Mix.